The Psychic is In - . 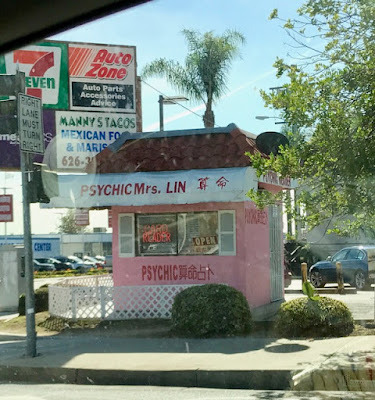 Nestled between parked cars, against the backdrop of 7-Eleven, AutoZone, and Manny's Tacos, sits the office of Psychic Mrs. Lin. Her office, located in the former home of a Fotomat. is a long time fixture in the town just south of ours and I've driven past it for years. I love the little white fence, and the satellite dish, but my favorite feature of Psychic Mrs. Lin's office is everything about Psychic Mrs. Lin's office. I love her tiny 'open' sign. I wish she was in my town. Have you been to see her?